Water quality monitoring shows that nitrate is present in groundwater throughout much of Nebraska and concentrations are increasing in some areas. Nitrogen is the nutrient applied for lawn and garden care and crop production to increase productivity. Feedlots, animal yards, septic systems, and other waste treatment systems are additional sources of nitrogen that is carried in waste. Nitrogen occurs naturally in the soil in organic forms from decaying plant and animal residues. Bacteria in the soil convert various forms of nitrogen to nitrate, a nitrogen/oxygen ion. This is desirable since the majority of the nitrogen used by plants is absorbed in the nitrate form. However, nitrate is highly soluble and readily moves with water through the soil profile. If there is excessive rainfall or over-irrigation, nitrate will drain below the plant’s root zone and may eventually reach groundwater. The health hazard associated with nitrate-contaminated drinking water occurs when bacteria in the human digestive system transform nitrate to nitrite. The nitrite reacts with iron in the hemoglobin, the substance in red blood cells that carries oxygen, to form methemoglobin. This creates the condition known as methemoglobinemia (sometimes referred to as “blue baby syndrome”), in which blood lacks the ability to carry sufficient oxygen to the individual body cells. Infants under one year of age have the highest risk of developing methemoglobinemia. An older person who has a gastrointestinal system disorder resulting in increased bacteria growth may be at greater risk than the general population. In addition, an individual who has a genetically impaired enzyme system for metabolizing methemoglobin may be at greater risk. The general population has a low risk of developing methemoglobinemia, even when ingesting relatively high levels of nitrate/nitrite. Testing public water supplies for nitrate is required under the federal Environmental Protection Agency (EPA) Safe Drinking Water Act. The EPA Maximum Contaminant Level (MCL) for public water supplies is measured and reported as nitrate-nitrogen, (NO3-N), which is the amount of nitrogen in the nitrate form. The MCL for nitrate-nitrogen in a public water supply is 10 milligrams per liter (mg/L) which also can be expressed as 10 parts per million (ppm). Testing of a private water supply is not required under federal or state law. If you want to know the concentration of nitrate in your private water supply, have the water tested by a certified lab. Do-it-yourself test kits are available, as well. These might be used for preliminary “screening” for nitrate-nitrogen in your well. However, analysis by an approved laboratory is recommended for an accurate, reliable, and precise measurement. An initial test of a new water supply by a testing laboratory is recommended to determine the baseline nitrate concentration in the water source. In addition, a water test is recommended for households with infants, pregnant women, nursing mothers, or elderly people. These groups are believed to be the most susceptible to nitrate health effects. Activities near a well potentially can contaminate the water supply, changing the nitrate concentration over time. Private drinking water wells should be tested annually to monitor changes in nitrate concentration. If nitrate-nitrogen exceeds 10 ppm, you might voluntarily consider an alternative drinking water source or water treatment. Decisions should be based on a nitrate analysis by a reputable laboratory, and after consulting with a physician to help evaluate the level of risk. It may be possible to obtain a satisfactory alternate water supply by drilling a new well in a different location or a deeper well in a different aquifer. As an alternative, drinking water can be treated to remove or reduce nitrate-nitrogen by three treatment methods: distillation, reverse osmosis, and ion exchange. Carbon filters and standard water softeners do not remove or reduce nitrate-nitrogen. 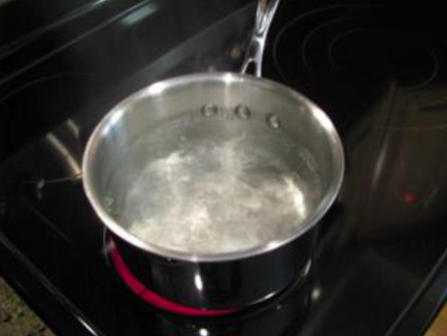 Merely boiling water does not remove or reduce nitrate-nitrogen. In fact, when water is boiled, water volume is lost through evaporation; nitrate is not lost through evaporation. This results in an increased nitrate-nitrogen concentration in the water that remains after prolonged boiling.